INTRODUCTION Melanocytic lesions of the eyelids run the spectrum from benign nevi and acquired melanosis, to invasive malignant melanoma. 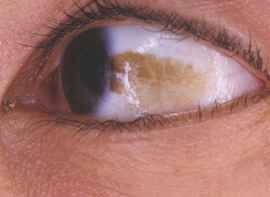 Acquired melanosis is very common, with nearly one-third of individuals of European descent having at least one patch of conjunctival melanosis in one eye. It generally appears in middle age. Melanosis consists of abnormally prominent intra-epithelial melanocytes, in contrast to melanocytic nevi where nests of melanocytes occur at the dermal-epidermal junction or wholly within the dermis. Primary acquired melanosis (PAM) is often considered to be pre-malignant melanoma-in-situ. Benign melanosis is more common in young individuals less than 20 years of age, whereas PAM and malignant melanoma pre-dominate in older individuals. Risk factors for malignant change include white race, older age, history of intense sunlight exposure, and cellular atypia within PAM. CLINICAL PRESENTATION Acquired melanosis typically appears as one or more flat patches of superficial brown pigmentation involving the conjunctival epithelium. Faint melanotic stippling is often seen beyond the margins of the lesion. The perilimbal area is a common site of involvement, as is the bulbar conjunctiva within the palpebral fissure. The lesion may extend onto the cornea, into the fornices, or onto the palpebral conjunctiva. The eyelids, especially the upper lid, should be doubly everted to examine the entire conjunctival surface. The lesions are usually darkly pig-mented, but may be amelanotic in rare cases. Darker focal thickenings or nodules, or involvement of the cornea or skin are suspicious for malignant transformation and must be biopsied. HISTOPATHOLOGY Primary acquired melanosis (PAM) is classified as lacking atypia or having mild, moderate, or severe atypia based on cell morphology and the pattern of growth within the epithelium. Neoplastic melanocytes may be small polyhedral cells with round nuclei and scant cytoplasm; spindle cells; large melanocytes with complex arborizing dendrites; or round epithelioid cells with abundant eosinophilic cytoplasm. The degree of atypia is deemed more severe as the nucleus enlarges and the nucleolus becomes more prominent. Cells occur in five growth patterns: (i) basilar hyperplasia, with proliferated melanocytes along the basal layer of the epithelium; (ii) basilar nests of melanocytes that push upward but do not invade the overlying epithelium; (iii) intraepithelial nests; (iv) spread of individual atypical melanocytes into the epithelium (pagetoid spread); and (v) almost complete replacement of the epithelium by atypical melanocytes. PAM is highly variable histologically within different areas of the same lesion, and prognosis depends on the predominant growth pattern. The presence of epithelioid cells and the lack of dominant basal hyperplasia are histological features associated with progression to melanoma. DIFFERENTIAL DIAGNOSIS Melanosis can be confused with melanocytic nevi, and malignant melanoma. Oculodermal melanocytosis (Nevus of Ota) can look similar but usually also involves deeper tissues such as the sclera and surrounding eyelid skin. When amelanotic, the differential should also include squamous cell carcinoma. There are no clearly established criteria for distinguishing benign melanosis from pre-malignant PAM. 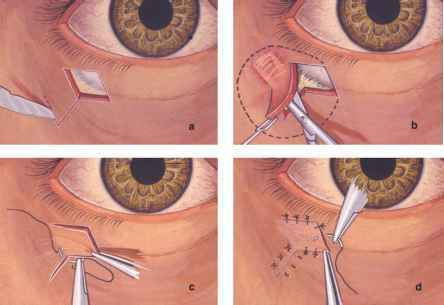 However, suspicion should be raised and a biopsy performed for lesions that show progressive growth, are large or multifocal, or those that involve the caruncle, plica, fornices, or palpebral conjunctiva. TREATMENT Acquired melanosis can usually be followed with observation if it is limited in extent and growing slowly. For those that enlarge more rapidly or are extensive, excision or biopsy is warranted. If there is no atypia, then the lesion can continue to be observed safely. Repeat biopsies should be performed if worrisome changes occur later. If atypia is seen on the initial biopsy then complete excision should be performed since these carry a nearly 50% risk of transformation to melanoma. If the biopsy shows atypia and areas of invasive melanoma then aggressive excision of the remaining lesion is performed with double freeze-thaw cryotherapy and topical alcohol. 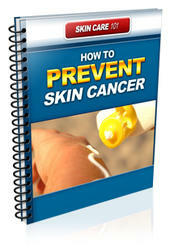 Topical chemotherapy with mitomycin C has also been reported to produce regression.